Although not as famous as Larry Ernst's Barris custom, Harry Bradley's is every bit as innovative and beautiful as that other hardtop. If you keep looking you will actually find many more modifications and styling tricks on this car. The unique thing is that the car has been owned and beautifully maintained by Harry Bradley all these years. 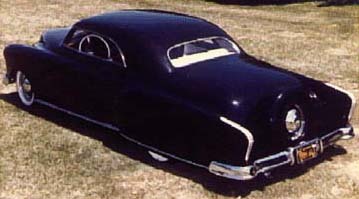 The chopped top, extended fenders, and the lip added to the bottom of the car increase he visual length and make the car long and flowing. Harry uses every trick in the book to direct the eye and make a design all the more pleasing. Harry Bradley continues drawing beautiful cars in all the current magazines and can be found at many of the shows around the country.